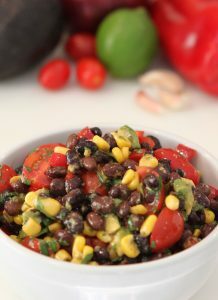 Party guests, family members and even the middle school kids where I volunteer, love this black bean salad. It’s colorful, zesty and extremely healthy. The dressing gives it a thick salsa quality and the fresh lime juice and cilantro make it pop. While the avocado is optional, it adds a creamy texture to contrast the crunchiness from the bell pepper and red onion. Make sure the avocado it’s not too ripe (mushy) so it holds its shape when mixing or not too green (hard) since it will be unpleasant to eat. Also, cut the grape tomatoes lengthwise so all the seeds don’t fall out. Health wise, this salad is high in antioxidants, potassium, vitamins and fiber, which most Americans lack in their diet. On average, adults eat about 10 grams of fiber when it should be more like 30 grams of fiber per day! Beans and lentils contain insoluble and soluble fiber which contribute to good digestion and cardiovascular health. You can make this salad beforehand and serve it chilled or at room temperature. It will go well with just about anything, chicken, beef or even blackened mahi mahi. Enjoy! In a small bowl, whisk together the dressing and set aside. 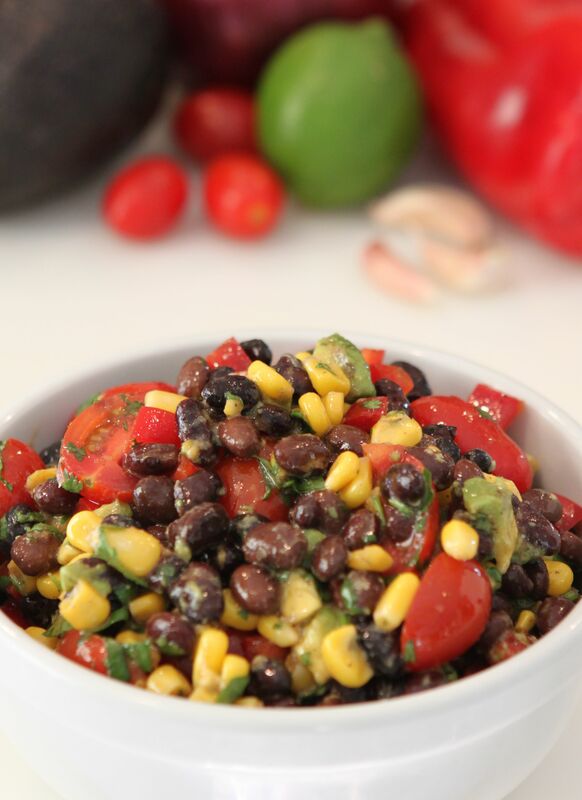 In a large bowl, combine the black beans, corn, red bell pepper, avocado, grape tomatoes, red onion and cilantro. Add the dressing and toss gently. Can be made in advance. Nutritional information*: Calories 143.5, Total Fat 8.7 g, Saturated Fat 0.5 g, Cholesterol 0 mg, Sodium 287.6 mg, Potassium 140.2 mg, Total Carbohydrates 15.4 g, Fiber 4 g, Protein 3.9 g.
Great Juan! Did you make it yet?